The Snap-On denture (also know as Implant Denture) is a complete denture that “snaps on” to dental implants. The implants are typically placed into the jawbone and allowed to heal for 3-4 months. 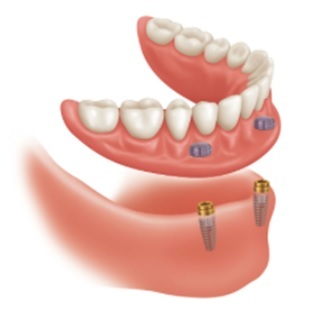 Then snaps are attached to the implants and either a new or existing denture can be converted to an implant denture. Your prosthodontist will teach you how to snap it into place and remove it for nightly cleaning. If you do not have implants yet, those will be placed first and allowed to heal for several months. If you have a well-fitting denture with unworn teeth, occasionally this denture can be converted to a snap-on denture after the implants are healed. But usually a new, better fitting denture must be made. After complete healing, we will begin the normal process to provide the best fitting denture for our patients. We go through a thorough impression appointment in which we capture the patient’s muscle movements as well as gum tissue. At the second appointment, a “wax-rim” is tried in as a template for the new teeth positions. We evaluate lip support, esthetics, phonetics, and function during this phase. The patient is also allowed at this appointment to choose their new teeth shape, color, and size. At the third appointment, the new teeth are tried in a wax phase so that the patient can see what they look like and how they speak with them. 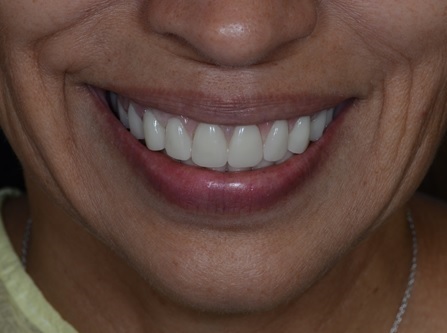 After approval, the dentures are finalized in acrylic resin and then fit to the implants at the final appointment. Snaps are placed onto the implants and into the denture, so that when the denture is inserted into the mouth, it clicks into place. Before leaving our office, we will ensure that you can insert and remove your denture on your own! You would like a more stable denture. Snapping the denture to the implants helps the denture stay-put, so that you don’t have to worry about the denture moving around while you are talking or eating.